The monza is a modern contemporary design of column radiator available in over 80 sizes, both vertical and horizontal. Any bespoke size can be made up on site. Delivery to merchants is within 3 days. Like all apollo radiators it is manufactured in Europe, in this case Italy. The monza is ideally suited to low temperature renewable systems, incorporating heat pumps and underfloor heating. Unlike most aluminium radiators it relies on waterways to conduct heat, the design and technology is patented, and also suited to high pressure systems. 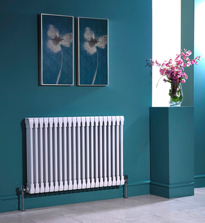 The monza is half the weight of steel column radiators, and available at a similar price. There are 46 colour options available within 7 days, the standard colour being ral 9016 white, available in 3 days.